When opening and operating a Coworking space, your staff will be required to wear different hats at different times. They are there to manage your operations, to help your community flourish, and establish the philosophy of your brand. This e-book covers the best practices for hiring as well as managing your staff. We’ll cover a myriad of subjects such as how much training your staff needs, whether your hires need prior experience in Coworking, as well as what budgetary considerations you’ll need to make. We conducted our research and reached out to two industry leaders regarding what practices to have in mind for staffing their workspaces. This e-book will show you the departments you must address immediately and what steps to take into consideration. 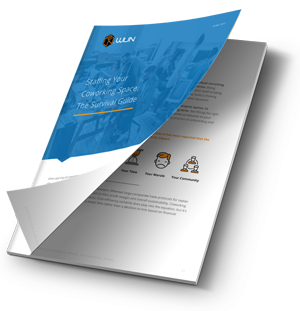 By following the outlined practices of this guide, you can entrust your staff not just with the survival of your space, but the livelihood of the community as well.